The battle was fought over a Raitaru engineering complex belonging to WAFFLES. [N0MAD]. The alliance had deployed to the region in order to generate some content, targeting the neighboring Providence region known for its combativeness. Providence Bloc did not take kindly to this deployment and decided to hit back, reinforcing the engineering complex. With the structure set to exit its invulnerability phase, both sides formed up for a major fight. Providence Bloc formed a 230 pilot Nightmare battleship fleet and made way to the region. It had also contacted groups such as Circle-Of-Two [CO2] and Snuffed Out [B B C] for aid as it was certain WAFFLES. would be reinforced by Pandemic Legion [-10.0] which is currently deployed in the nearby region of Curse. This proved true as scouts reported a joint Pandemic Legion\WAFFLES. Proteus strategic cruiser fleet of 200 pilots waiting for the coalition on its most likely point of entry, the Misaba gate. Beside it, WAFFLES. 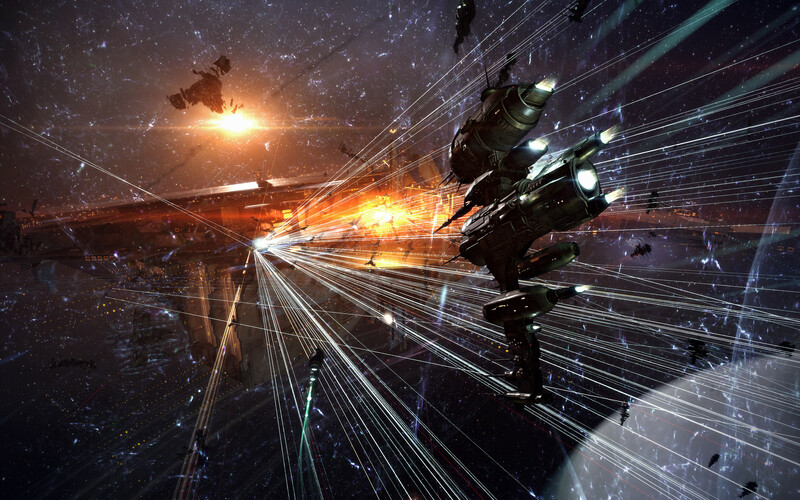 had also brought 30 combat carriers to the system and kept them tethered to the Raitaru. Playing for time, Providence Bloc declined to jump into Pandemic Legion\WAFFLES.. Instead the coalition’s fleet circled around the system, attempting to enter through the Hoshoun system though a few individuals sadly did not follow orders and jumped straight into the waiting strategic cruiser fleet which dispatched them with ease. Realizing what Providence Bloc was doing the strategic cruiser fleet warped to the Hoshoun gate as the Nightmare fleet jumped through, leading to both sides finding themselves face to face. The two fleets anchored up, the battleships trying to put some distance between them and the strategic cruisers. The strategic cruisers gave chase and both sides traded blows at close range. The Nightmare fleet had prepared for such a battle and equipped its battleships with pulse laser batteries as well as energy neutralizers. It attempted to clear hostile support ships, managing to destroy a command ship and a few strategic cruisers. This forced Pandemic Legion to bring a few force auxiliaries to the field to help tank the incoming damage. The strategic cruisers had much greater success in volleying battleships. While Providence Bloc struggled at times to break through the armor of the strategic cruisers they had no trouble in turn overcoming the battleships’ shields. Nightmares came down one after the other, accompanied by assorted support ships and a few logistics cruisers. In a bid to slow and even stop the bleeding, Providence Bloc lit a cynosural beacon on the gate and brought through it two force auxiliaries. Pandemic Legion reacted immediately, lighting a second beacon and bringing a whole dreadnought squadron to the field to get rid of the ships. The mass of dreadnoughts materialized on the grid and opened fire on the force auxiliaries, destroying them within a couple of minutes. Unable to break through the force auxiliary remote armor repair cycles, Providence Bloc decided instead to focus on the force auxiliaries rather than the strategic cruisers. The fleet applied its energy neutralizers to the ships to pressure them further while blasting them with constant pulse laser fire. One of the force auxiliaries caved in to the onslaught at which point Pandemic Legion had brought in its dreadnoughts which became the new focus of the battleship fleet. The battle raged on with the combat carriers joining the fray. The ships warped in 60 kilometers from the fray and deployed fighter squadrons to augment the strategic cruisers’ firepower. The fighters quickly descended upon Providence Bloc’s Nightmare fleet but due to time dilation effects had trouble applying some of their damage. Regardless the strategic cruiser fleet remained able to volley battleships on its own and racked quite a body count by that point. The Nightmare fleet managed to bring down one dreadnought but there was still a whole squadron of them loitering on the gate not to mention the arrival of the combat carriers. Whats more the fleet was unable to stabilize, losing more and more ships by the minute. Contemplating retreat, the fleet started to burn away from the hostiles in order to withdraw. However, reassurance from their allies that reinforcements were on route convinced the battleship fleet to soldier on. The battleships continued to engage the strategic cruisers, switching targets in an attempt to catch the strategic cruisers’ logistics wing off guard. The fleet was successful in destroying a few ships before it once again concentrated on the dreadnoughts. Reinforcements were indeed en route. First in the system was a 140 pilot Snuffed Out\Project.Mayhem. [16-13]\Pen Is Out [WANGS] Proteus fleet which entered only a few moments before a 220 pilot Circle-Of-Two Machariel battleship fleet that bridged in. The two fleets warped to the Hoshoun gate to join the fray, swiftly tackling whatever capital ships were near them. Pandemic Legion\WAFFLES. saw the large spike in local and decided to disengage, the Proteus fleet warping off followed by most of the capital ships. However some of the combat carriers did not warp in time and found themselves tackled by the hostile forces. Added to them were most of the dreadnoughts on the gate which were still immobile due to their siege cycles. Providence Bloc and its allies made short work of them all, destroying them in rapid succession. In all the commotion the Raitaru itself had exited its invulnerability phase and quietly repaired itself, securing the objective for Pandemic Legion\WAFFLES.. The field though had been thoroughly won by Providence Bloc and allies who proceeded to extract later and finally bring an end to the fighting. Battle report for the Mamet system can be found here. All told that battle lasted 52 minutes with Time Dilation reaching at one point 10% but subsiding and remaining according to reports around the 50% mark for most of the fighting. The system itself hosted an estimated 800 pilots near the end of the fight. Pandemic Legion\WAFFLES. lost 22 ships in the fighting including 10 dreadnoughts, 3 combat carriers, 1 force auxiliary and 4 strategic cruisers for a total of 48.46 billion ISK damage. Providence Bloc lost 67 ships including 2 force auxiliaries and 33 battleships for a total of 24.58 billion ISK damage. Hi there. I discovered your blog by the use of Google even as looking for a related matter, your site got here up. It appears good. I have bookmarked it in my google bookmarks to visit then. Hi there. I found your site by means of Google at the same time as searching for a related subject, your website came up. It appears to be great. I’ve bookmarked it in my google bookmarks to visit then. I’ve been exploring for a bit for any high quality articles or blog posts on this kind of area . Exploring in Yahoo I at last stumbled upon this web site. Reading this info So i am happy to convey that I have a very good uncanny feeling I discovered exactly what I needed. I most certainly will make sure to don’t forget this site and give it a look on a constant basis. Hey there. I discovered your site by way of Google while looking for a related topic, your site got here up. It looks great. I have bookmarked it in my google bookmarks to come back then.